Sequani uses laboratory animals in order to help companies identify and predict clinical and adverse events in humans. This is done to ensure the highest possible standards of product safety. The overall purpose of the tests performed by Sequani is to ensure public health and safety. Before any new product can be put on the market, companies and regulators need to be confident that any risk it presents is acceptable to humans, animals and the environment. As part of the safety assessment to evaluate these risks, it is a legal and regulatory requirement to conduct tests involving animals. We are fully accredited by the Association for Assessment and Accreditation of Laboratory Animal Care International (AAALAC www.aaalac.org), accreditation was the first in Europe and was received in 1986 with reaccreditation at every subsequent visit and assessment. We continuously strive to limit the number of animals used to a minimum. We are firmly committed to the development and, where these are approved by the regulatory authorities, the use of non animal-based alternatives to the use of animals in human and veterinary pharmaceutical safety evaluation. Indeed, we routinely use a range of bacterial and cell culture non animal alternatives. Alternative models are implemented as soon they are internationally accepted and in vitro screening models are developed as alternatives to laboratory animal experiments. Alternative methods are not yet available to replace animals in all of the testing that is necessary and, although significant progress has been made, it is likely to be a considerable time before the use of animals can be completely eliminated from safety testing. The use of animals within the United Kingdom is controlled by the Animals (Scientific Procedures) Act 1986. Under this Act, the premises in which laboratory animals are housed and experiments performed are detailed in an Establishment licence. Working to or above the Codes of Practices ensure that the conditions for housing, care and welfare of laboratory animals meet stringent standards and that the well-being of laboratory animals remains a high priority. The performance of regulated procedures, as defined by the Act are conducted by experienced persons who having first demonstrated their understanding and competency in the task and have been granted a personal licence by the Secretary of State. In addition, each experiment must be authorised by a Project License which lays out and analyses the potential benefits of the work and the expected cost to the animals. Compliance with the Act is policed by a team of Home Office Inspectors who have legal right of access to all areas within an establishment without prior warning. These inspectors are charged with ensuring that no procedures are carried out without appropriate licenses being in place and that at all times the highest standards of animal care and welfare are achieved. The studies performed with laboratory animals at Sequani are commissioned to meet the requirements of regulatory health authorities. All animal studies are performed according to international guidelines for the conduct of studies and animal welfare issues. Ethical considerations and animal welfare are always given the highest priority. The laboratory animals used at Sequani are bred specifically for experimental purposes. The housing, husbandry and transport of laboratory animals, as a minimum, comply with internationally accepted standards. Qualified veterinary surgeons are also available at all times to assist and for help and advice in the care of laboratory animals and conduct of studies. Only people with appropriate levels of training are permitted to work with laboratory animals. Sequani continues to develop comprehensive training programmes designed to increase the understanding, knowledge and dedication of those working with laboratory animals. The staff at Sequani have been practically and theoretically trained to ensure animal welfare is maintained at the highest standards. Sequani has an Animal Welfare and Ethical Review Body (AWERB) with representatives of scientific, non-scientific, veterinarian staff and lay people. Their primary aim is to continuously improve the quality of life for the laboratory animals; through expertise and knowledge to develop new handling techniques, housing conditions and to identify new initiatives for environmental enrichment. Sequani’s use of animals is subject to stringent ethical review and we are fully committed to the principles of the 3 Rs: Reduction (of the number of animals used), Refinement (implementation of the most humane procedures) and Replacement (of animals with non-animal alternatives, wherever this becomes possible). 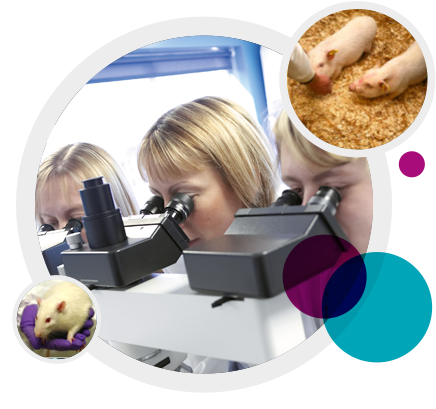 At Sequani we are committed to help the public understand more about animal research and as such are a signatory to the Concordat on Openness on Animal Research. Typically around 90% of animals used for regulatory studies at Sequani are rodents - rats and mice. Other species used include rabbits, dogs and pigs. These animals are specially bred for use in research and cared for to the very highest standards of animal welfare.